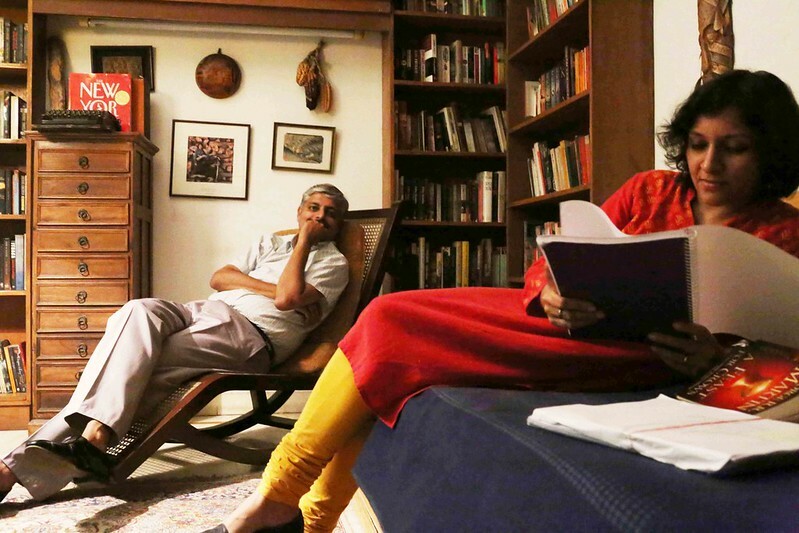 Sometimes a collection of books becomes a portrait of a marriage. 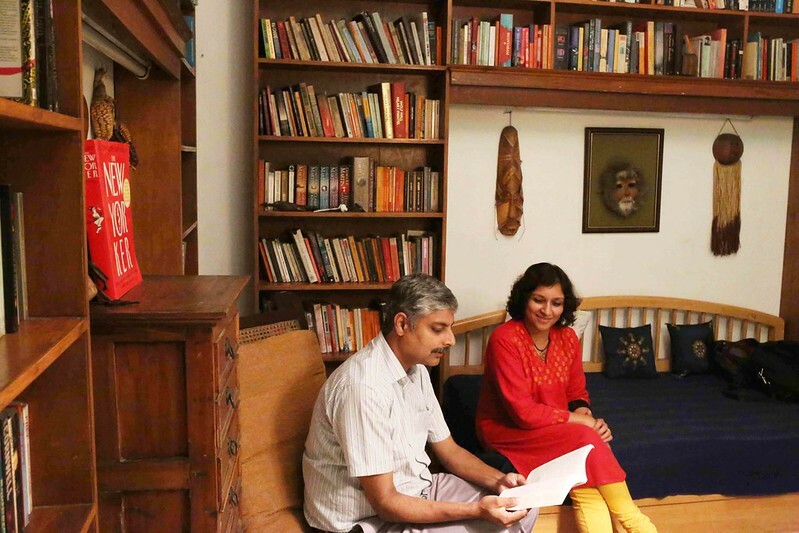 One evening, The Delhi Walla visited Karthika VK, publisher of HarperCollins India, at her East of Kailash home. In her late 40s, Ms Karthika shares a first-floor apartment with her dogs, Sundari and Crush, sons Shiva and Shasta, and husband, Vivek Menon. Ms Karthika has thousands of books at her home. Only a few, however, are from her company. Those books, she says, are at her office in Noida. 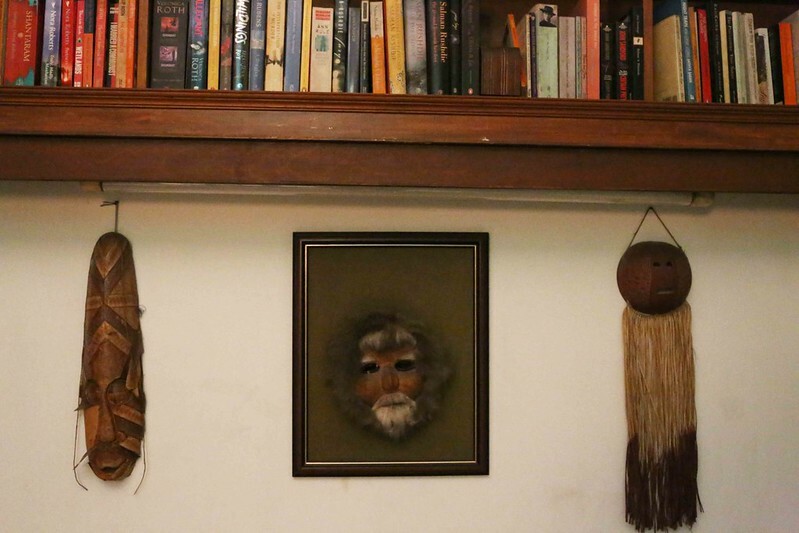 The books at her home are mostly those that she has gathered over the years as an archetypal bibliophile. One can understand a person by surveying their bookshelves. But Ms Karthika’s collection is mixed with that of her husband. His interests seems to veer toward animals and jungles. Mr Menon is the Executive Director and CEO of the Wildlife Trust of India. During a recent trip to London, he bought six books with titles such as How to be a Bad Birdwatcher: To the Greater Glory of Life. The story goes that the husband and wife first met each other in 1998. 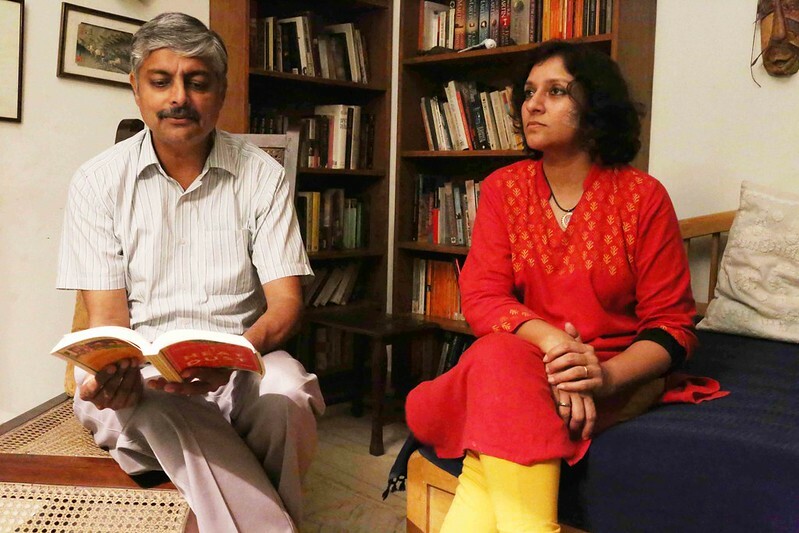 The fateful meeting took place over to-be-pulped books that Ms Karthika had salvaged for herself in the warehouse of Penguin India, her former employer. Actually she was carrying the booty home in a mini-van when her colleague, who was with her, took her to the home of his friend, a certain Vivek Menon, in Amar Colony. The friend became excited over the books. Ms Karthika was obliged to part with some of her booty. And this generosity set up the foundation of their relationship, and consequently of their present library, which teems with writers of all kinds. Roald Dahl stands next to Rana Dasgupta. Novelist George RR Martin has an entire shelf to himself. There are the Booker Prize winning novels by Hilary Mantel. Ms Karthika herself has published one Booker Prize winning novel—White Tiger by Aravind Adiga. Salman Rushdie is stacked next to Saki. WG Sebald lurks close by. While the gigantic The Complete Cartoons of The New Yorker dominates the dimly-lit room like a megalomaniac dictator. 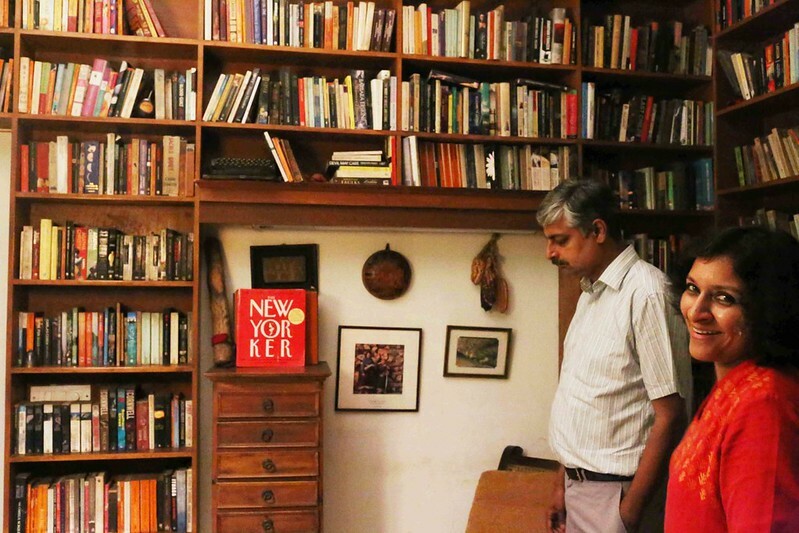 Ms Karthika says that her husband received that book as a gift from his father, who apparently has a much larger library at his home in Tamil Nadu. 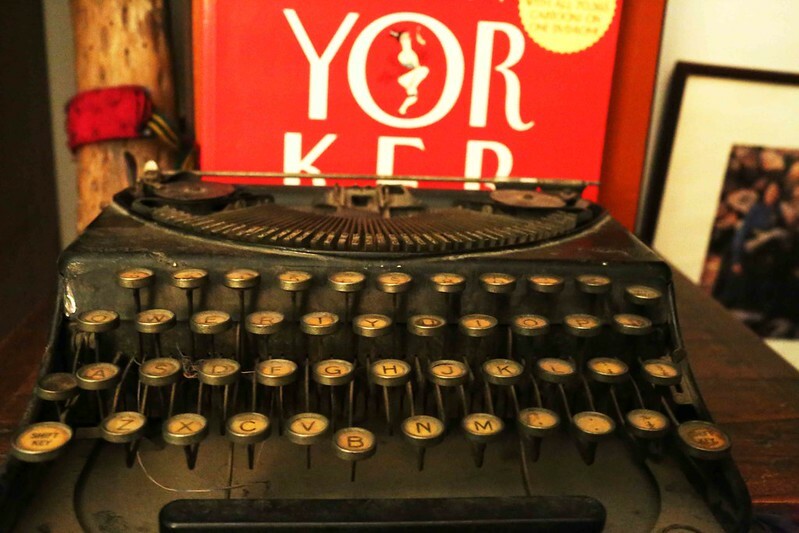 The highlight of the library is an old Remington typewriter. It belongs to Mr Menon’s grandfather, who was a mathematician. The grandfather taught that subject at the Doon School for several years. The couple do not have a common taste in reading. She likes fiction. He likes non-fiction as well as fiction (but no pulp please). She likes to get her books from the Full Circle bookstore in Greater Kailash I (“It has the lovely Cafe Turtle where I often meet my authors”). He likes to get his books from the Bahrisons Booksellers in Khan Market. Interestingly, long before his marriage, Mr Menon was a regular visitor to the now-closed The Book Shop in Khan Market. 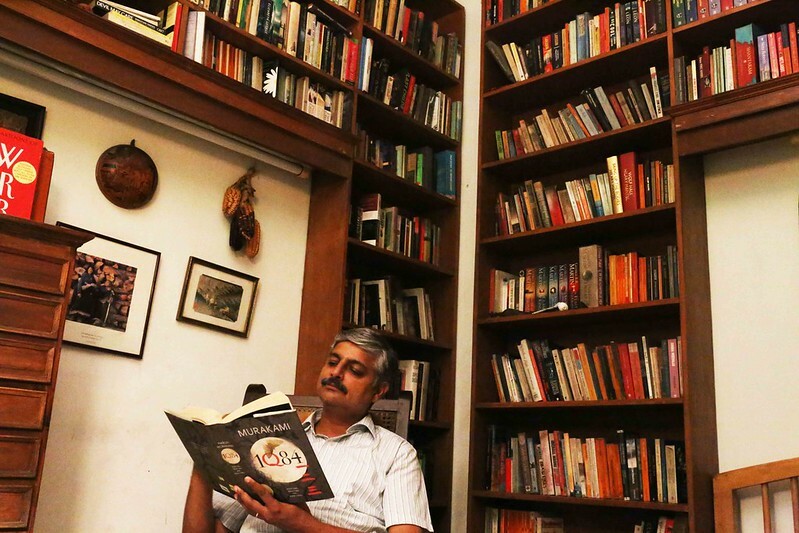 He confesses he used to go there primarily “to admire the beauty” of the bookshop owner’s eldest daughter, Rachna Singh. ‘She used to sit there everyday in the afternoon,” says Mr Menon. The evening lurches on. Mr Menon flips through Haruki Murakami’s 1Q84. Eventually he settles down on the planter’s chair, the most handsome piece of furniture in the library. 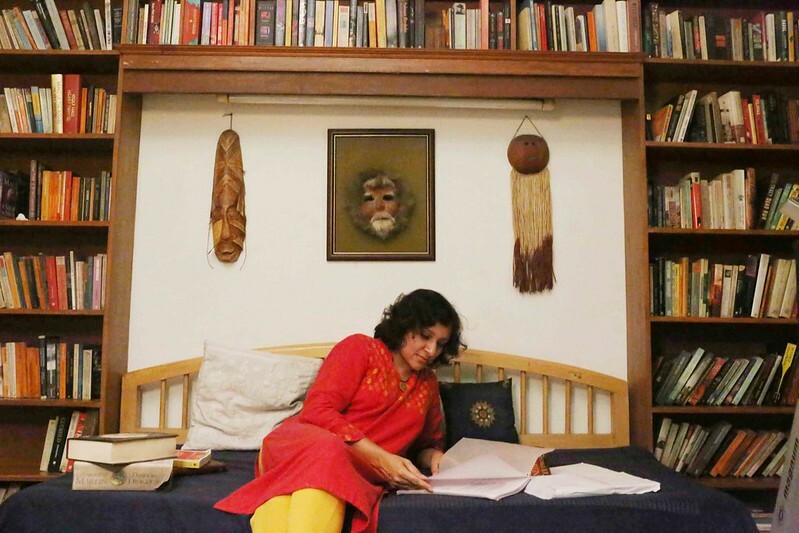 Ms Karthika settles down to read a printed manuscript she had carried along from the office. What a gorgeous space and what a lovely couple, who share the same passion. Love this post by you Mayank. How beautiful the rom looks, and how lovingly you have captured the images. And i am so smitten by all those books. Lovely article but why have you covered only people who MUST have and love books by their very professions? 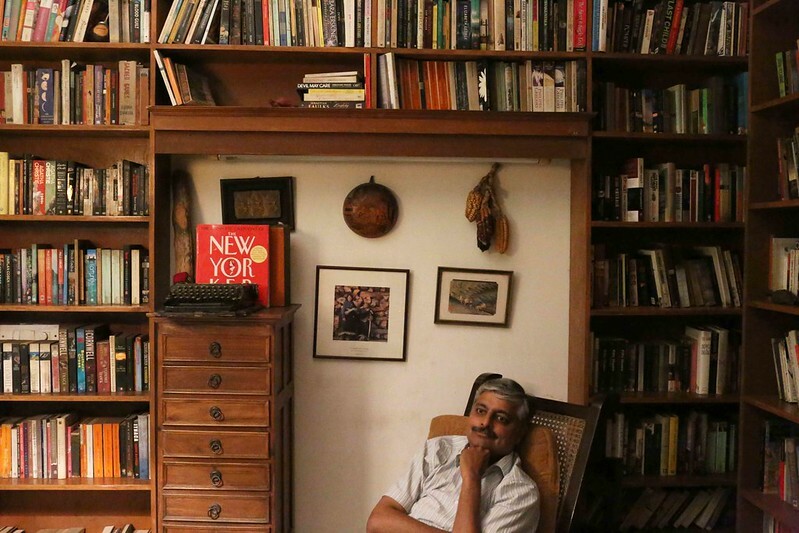 I’d love to see you cover a CA, Mr Sunil Bhatia who is one of the most eruditeand comprehensively read men I’ve come across and who has an amazing library at his residence. Why are all the framed items on the walls mounted crooked?